Each September, the design community descends on the British capital for the London Design Festival. 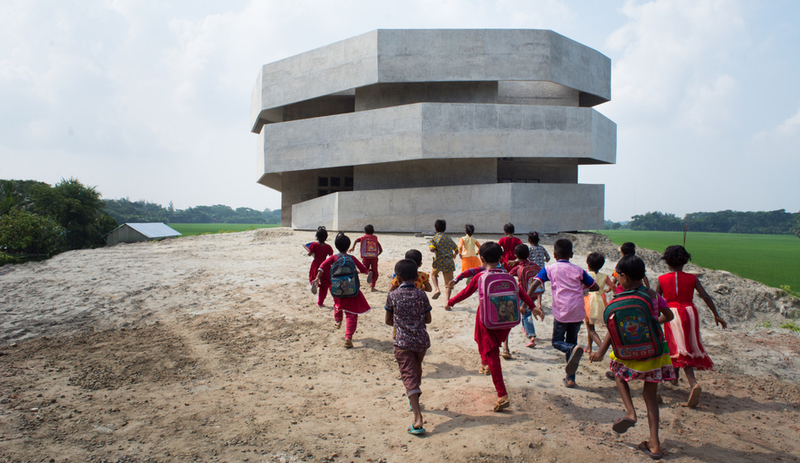 This year, show organizers launch a new event with the city’s inaugural design biennale. 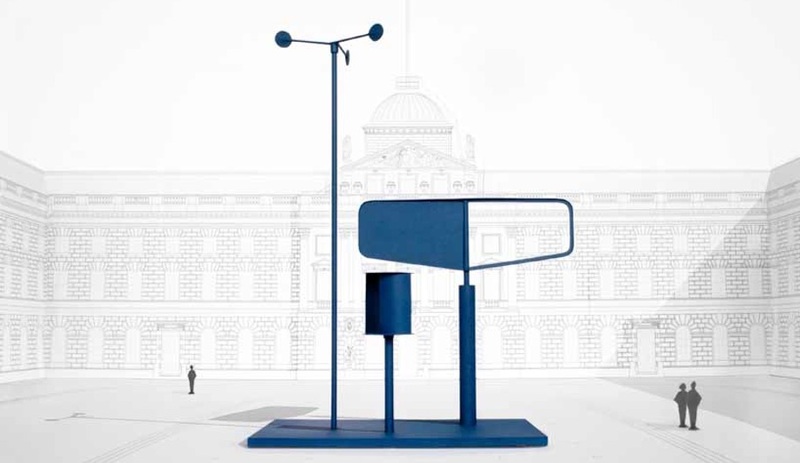 Groups from more than 30 countries will present interpretations of the theme “Utopia by Design,” at Somerset House. 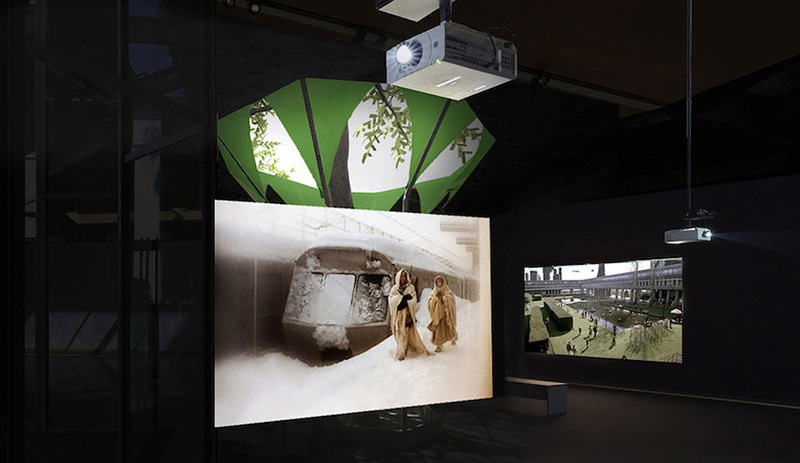 Installations from Barber & Osgerby (collaborating with the Victoria and Albert Museum to represent the U.K., with the pavilion shown above) and a group of Lebanese architects will take over the venue’s courtyard. The same setting will also host Albanian artist Helidon Xhixha’s reflective pavilion, which sees a central column of mirrors surrounded by a series of benches. 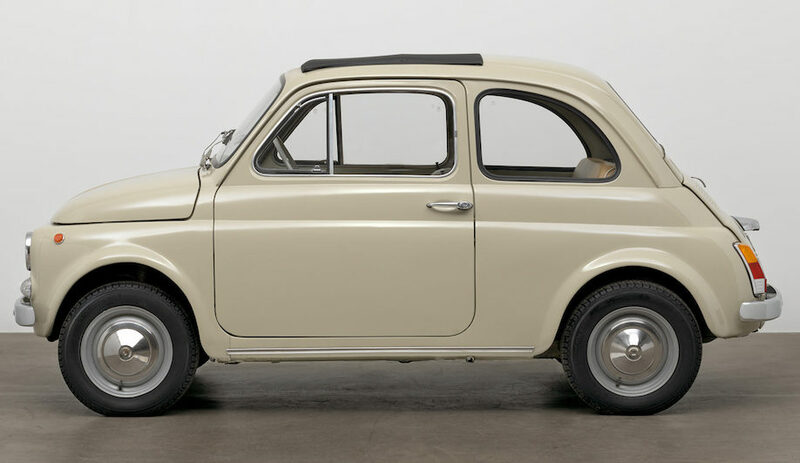 Inside, a German group led by Konstantin Grcic will exhibit their psychological interpretation of the theme. 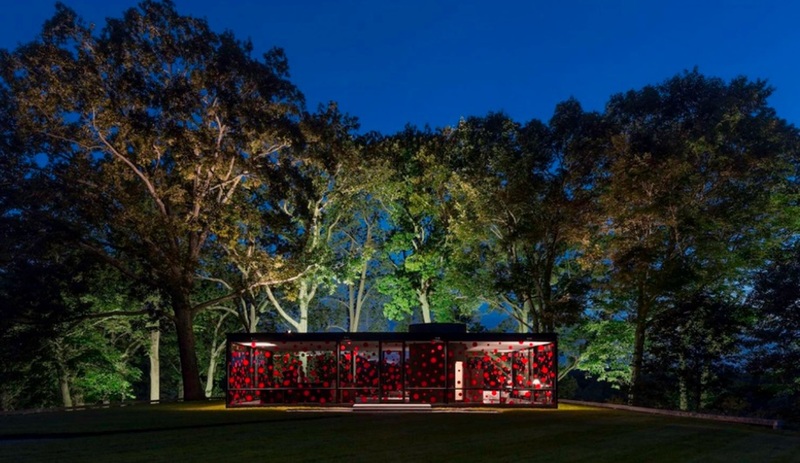 Ten years ago, on the 100th anniversary of architect Philip Johnson’s birth, his famous residence, Glass House, was opened to the public. 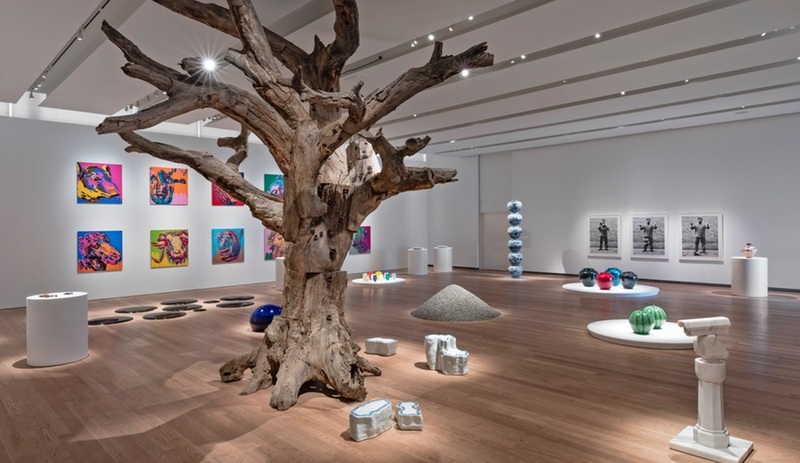 Both of these milestones are being commemorated with a spectacular seven-month long installation at the landmark. Since May, the recently restored pond has bobbed with a series of shimmering, silvery orbs. Over 1,300 of these spheres float freely through the water, reflecting the surrounding trees, sky, and adjacent pavilion. 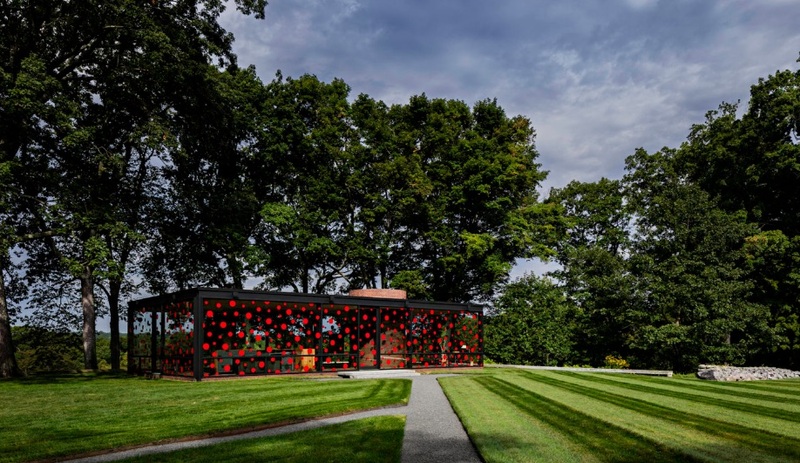 Japanese artist Yayoi Kusama has now added a second intervention at the site, peppering the facade of the Glass House with her signature polka dots. 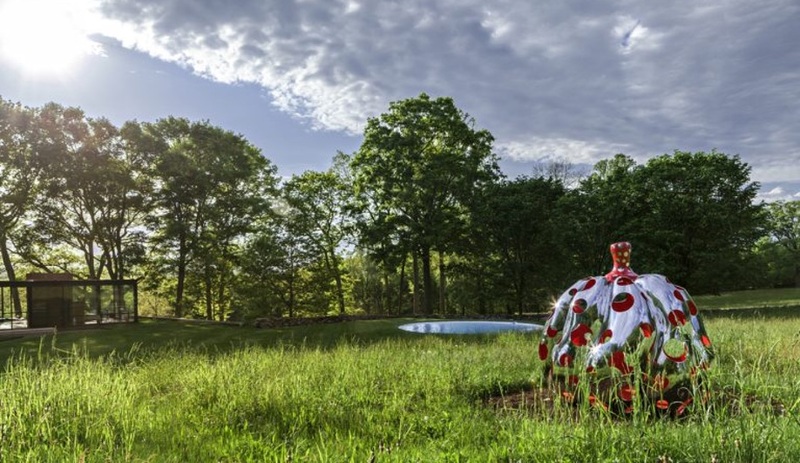 While Narcissus Garden is on view until November 30, Kusama’s red spots are only in place for the month. On this side of the pond, another brand-new event will debut this September. New York Textile Month is headed up by trend forecaster and dean of Parson’s new Hybrid Design Studies department, Li Edelkoort. A revived interest in textiles, due to recent innovations in fabrics, prompted Edelkoort to initiate this festival, which will link with such existing events as New York Fashion Week, and include a series of exhibitions. Participating venues include MoMA, the Cooper Hewitt Design Museum the Metropolitan Museum of Art and the MAD Museum, where artists Christine and Margaret Wertheim will present Crochet Coral Reef: Toxic Seas. 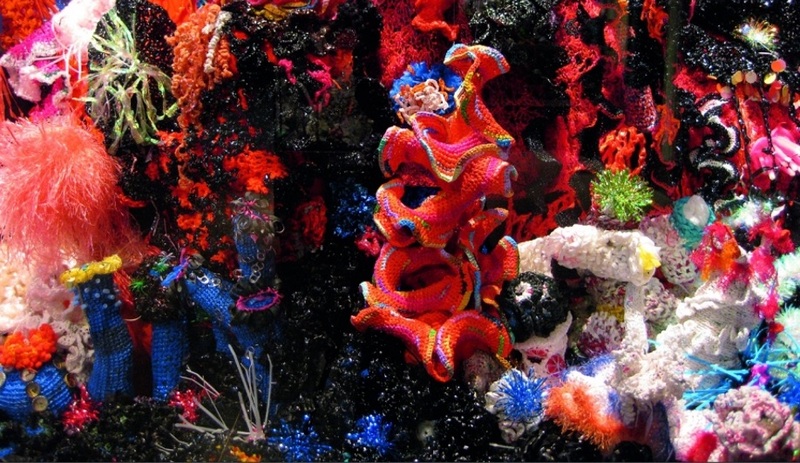 The installations evoke marine habitats made using a combination of crocheted yarn and plastic ocean waste. Fibre art will also be in the spotlight in Toronto, with this annual textile show at the Gladstone. For its 11th edition, the show knits together a series of works inspired by the art of transformation. The curated selection of pieces is chosen by a jury that includes OCAD University’s material art & design chair Dorie Millerson, and Toronto Design Offsite Festival co-founder Julie Nicholson. 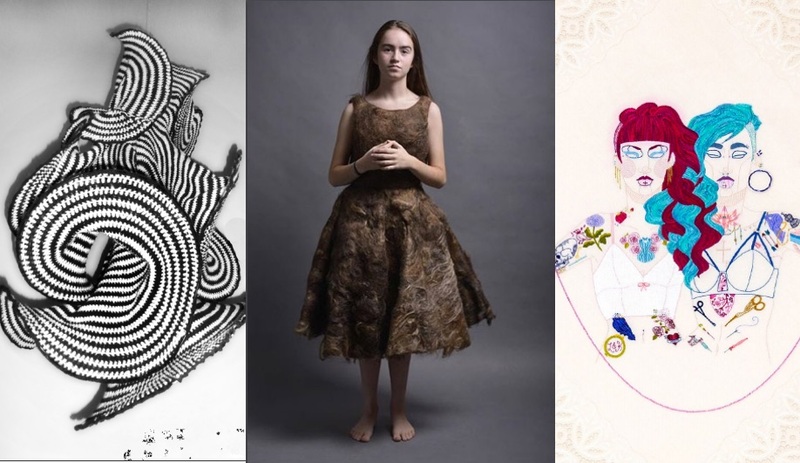 Be sure to see Lynne M. Mack’s sculptural work (left), Annabel Berthoff’s hand-sewn dress of felted human hair (middle), and Ketzia Kobrah’s embroidered illustrations. 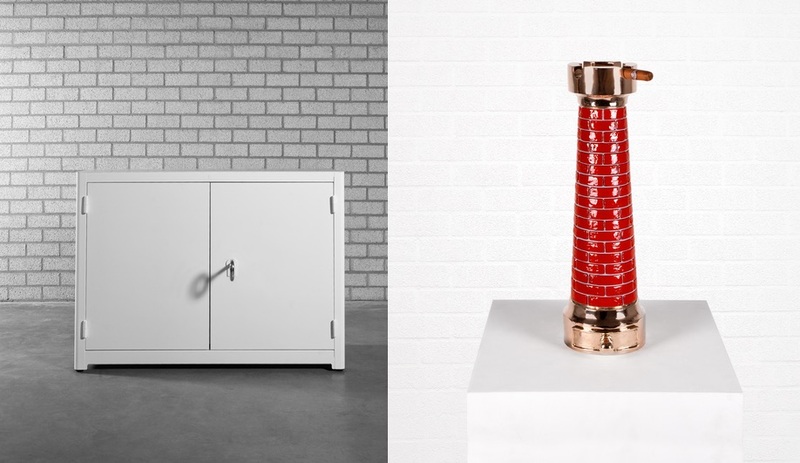 To mark its two-year anniversary, the gallery brings together a unique collection of cabinets and curios by nine top design talents. Owner Juan Garcia Mosqueda invited several of Chamber’s oldest friends to participate in the celebration, including MOS Architects, which designed the interior. 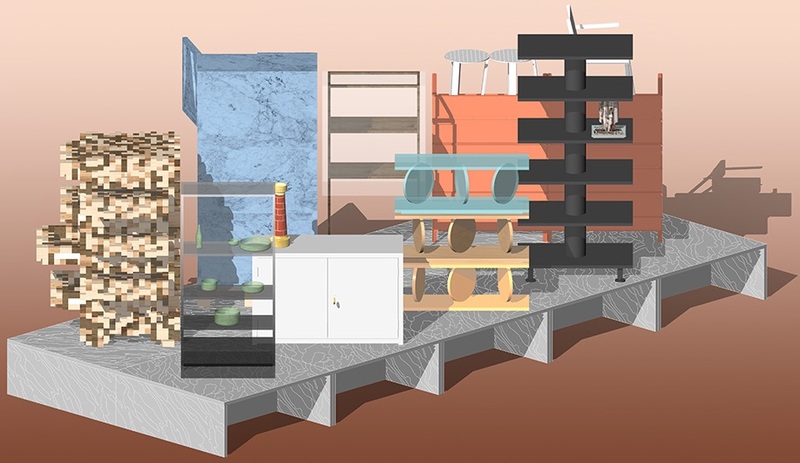 Dutch duo Studio Job, who curated the gallery’s inaugural exhibition, will show their Chimney Ashtray, alongside Job Office Dressoir, a collaboration with Lensvelt. 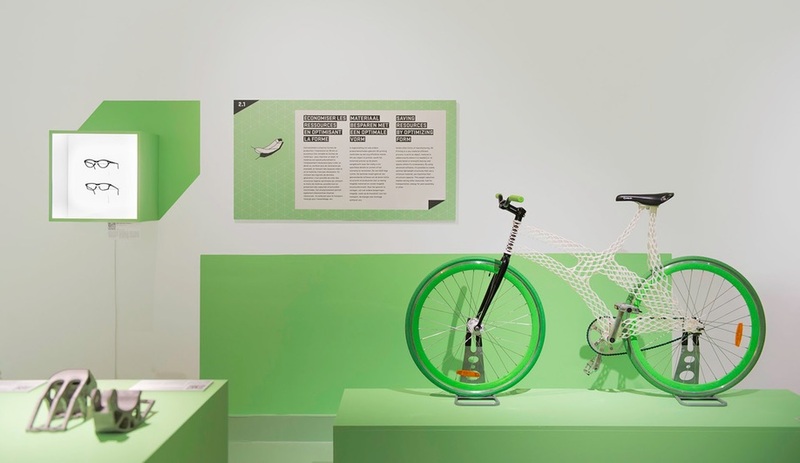 This exhibition explores the social and economic challenges facing the U.S. and its bordering neighbours, and how they can be addressed through design. Rural communities and sprawling cities are equally represented among 60 examples of socially responsible initiatives. 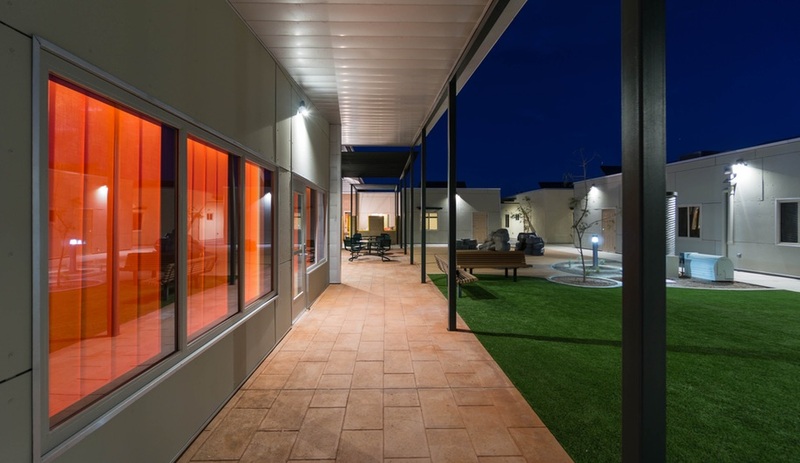 Among them is Las Abuelitas Kinship Housing – an energy-efficient complex in Arizona, designed for multi-generational families by Poster Frost Mirto. 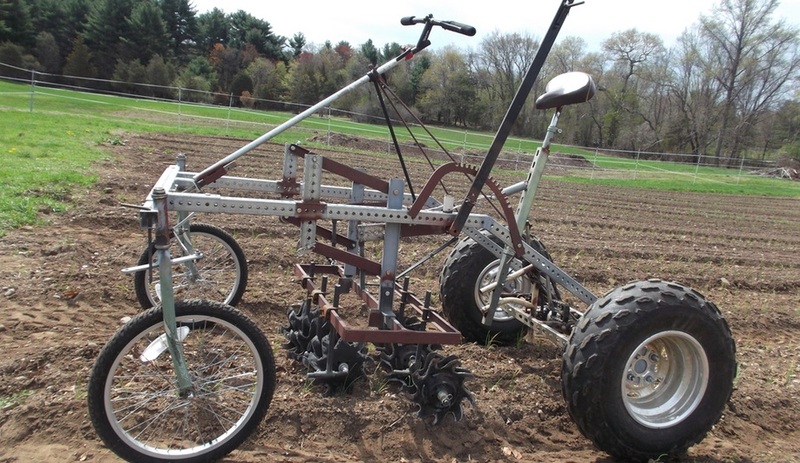 Also on view is Culticycle, a pedal-powered tractor. Opening at the end of the month, this show brings together the most innovative works produced by Belgium’s world-renowned 3-D printing experts Materialise. Encompassing design, art, science and engineering, the pioneering examples on display will include pieces by James Novak (creator of the 3-D-printed bike shown above), Iris van Herpen and Patrick Jouin.